Throwable() - Constructs a new throwable with null as its detail message. Throwable(String message) - Constructs a new throwable with the specified detail message. Throwable(String message, Throwable cause) - Constructs a new throwable with the specified detail message and cause. protected Throwable(String message, Throwable cause, boolean enableSuppression, boolean writableStackTrace) - Constructs a new throwable with the specified detail message, cause, suppression enabled or disabled, and writable stack trace enabled or disabled. Throwable(Throwable cause) - Constructs a new throwable with the specified cause and a detail message of (cause==null ? null : cause.toString()) (which typically contains the class and detail message of cause). void addSuppressed(Throwable exception) - Appends the specified exception to the exceptions that were suppressed in order to deliver this exception. Throwable fillInStackTrace() - Fills in the execution stack trace. Throwable getCause() - Returns the cause of this throwable or null if the cause is nonexistent or unknown. String getLocalizedMessage() - Creates a localized description of this throwable. String getMessage() - Returns the detail message string of this throwable. StackTraceElement getStackTrace() - Provides programmatic access to the stack trace information printed by printStackTrace(). Throwable getSuppressed() - Returns an array containing all of the exceptions that were suppressed, typically by the try-with-resources statement, in order to deliver this exception. Throwable initCause(Throwable cause) - Initializes the cause of this throwable to the specified value. 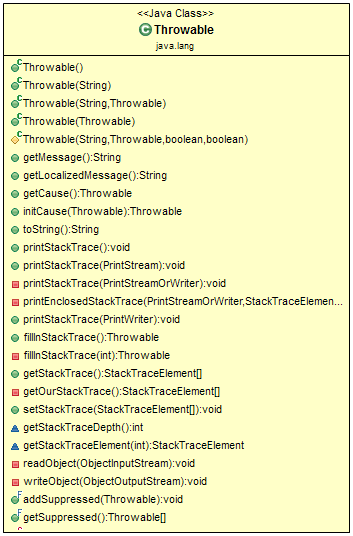 void printStackTrace() - Prints this throwable and its backtrace to the standard error stream. void printStackTrace(PrintStream s) - Prints this throwable and its backtrace to the specified print stream. void printStackTrace(PrintWriter s) - Prints this throwable and its backtrace to the specified print writer. void setStackTrace(StackTraceElement stackTrace) - Sets the stack trace elements that will be returned by getStackTrace() and printed by printStackTrace() and related methods. String toString() - Returns a short description of this throwable.